I saw an interesting strata recipe in a magazine (at a doctor’s office no less) but then after some research decided that this was the one that I wanted to try. 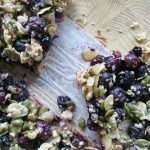 It’s adapted from Gourmet magazine, and thankfully most of their recipes are still accessible online – just remember that this should be put together the night before. The original recipe called for only 1 package of spinach, and the only other thing I’d consider next time would be to make this exact amount, but use my large lasagna pan – the crispy bits are the best part. We enjoyed this for Sunday brunch with some smoked sausage, watermelon and a coffee cake. Saute the onion in a bit of oil for about 5 minutes until softened and then add in the salt, pepper and nutmeg. Stir in the spinach and cook only until there’s no longer any liquid and then remove the mixture from the heat. Liberally spray a good-sized baking dish (I used my 4 L casserole) and spread a third of the bread cubes across the bottom. 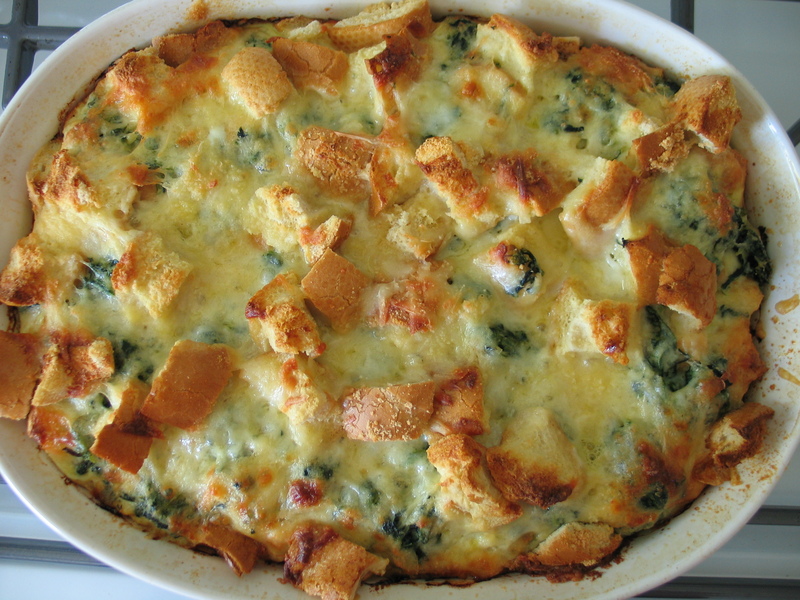 Top with half of the spinach mixture and a third of each cheese. Continue layering with bread, spinach mixture, cheese, the last of the bread and finish with the last third of the cheeses. In a large bowl, whisk together the milk, eggs and Dijon and then pour this evenly over your beautifully layered strata. Cover tightly and chill for at least 8 hours or up to a day. The day/morning/meal you’re going to cook this, take it out a good half hour before it goes into the oven so that it can come to room temperature. Preheat the oven to 350 and bake, uncovered for about an hour, until it’s puffed, golden and crisp on top and cooked through. Allow it to rest for about 10 minutes before serving and enjoy!